Just five months after scientists in China made history by modifying the germline of human embryos, a research team in the U.K. is requesting permission to do the same, but strictly for research into infertility. Given recent calls for a moratorium on such research, the decision is likely to set a precedent for future requests. Scientists working at London’s Francis Crick Institute have submitted a formal request with the U.K.’s Human Fertilisation & Embryology Authority (HEFA) to use a gene editing technique for research into human infertility. The researchers have no intention of bringing their genetically modified embryos to term, nor will they be implanted; the scientists are reassuring HEFA and the public that all embryos will be destroyed. Should permission be granted, it will mark the first time that scientists in the UK—or anywhere in the world for that matter (China excepted)—will have the opportunity to conduct research of this nature, which many consider controversial. Soon after the announcement of the Chinese achievement, a number of scientists called for a moratorium on this particular line of research, citing moral, ethical, and safety concerns. The United States has since imposed a moratorium on federally-funded research in this area, and a major conference on the matter is currently being organized by the U.S. National Academy of Sciences, to be held in Washington, D.C. from December 1-3, 2015. The situation in Britain is a bit different. 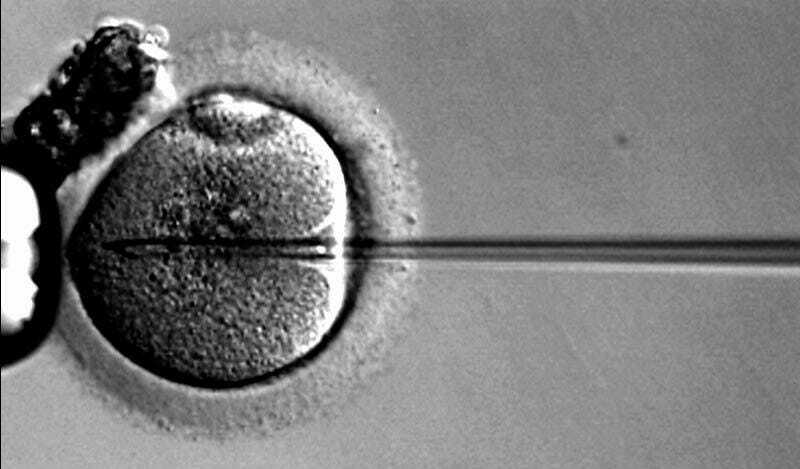 It is currently illegal to genetically modify embryos in preparation for IVF, but it is allowed for research purposes so long as a license has been granted. However, Britain is the first country in the world to sanction three-parent IVF, a technique in which babies are produced from the genetic material of three people to eliminate rare mitochondrial diseases. In the U.S., a panel of experts is currently investigating the procedure, and a decision about its use in the country is expected shortly. provide further fundamental insights into early human development [by testing] the function of genes using gene editing and transfection approaches that are currently permitted under the HFE Act 2008. We also propose to use new methods based on CRIPSR/Cas9, which allows very specific alterations to be made to the genome. By applying more precise and efficient methods in our research we hope to require fewer embryos and be more successful than the other methods currently used. in line with HFEA regulations, any donated embryos would be used for research purposes only. These embryos would be donated by informed consent and surplus to IVF treatment. The researchers agree with the larger scientific community that the use of the technique to bring modified babies to term would be “foolish” at this stage. There’s no question that the use of CRISPR/Cas9 as a means to modify and bring babies to full term is premature. And as the experiment performed in China earlier this year demonstrated, we’re still a long ways off from having the scientific know-how to do this safely and effectively. But in all fairness, this is not really the issue at hand. Rather, we have a group of scientists who want to manipulate and study human embryos to further our insights into genetics and infertility. By doing so, scientists stand a better chance of improving embryo development after IVF and providing better clinical treatments for infertility. IVF is a longstanding practice to allow couples in need to conceive, however success rates are still low. Understanding what genes are important in human development could improve current success rates and prevent unwanted miscarriages as well as improve our basic understanding of human development and genes required for successful IVF. The debate will surely continue on gene editing in human embryos and initiation of these studies should open up a platform for healthy debate to enact sensible legislation that will allow for research on improving our understanding of human development and IVF. This will be required for successful research to continue in an ethical manner and yet still enable these important research studies to continue while preventing clinical use of human gene editing. Indeed, work on human embryos must continue—even if it involves germline modifications. A central precept of science—one reinforced by the laws of many nations—is that embryos are not objects worthy of moral consideration. They’re simply clumps of cells incapable of feeling or conscious thought. It is perfectly acceptable for scientists to study these precursors of human life, so long as commonsense guidelines are followed and consent is issued (particularly by the donors). In regards to the Francis Crick Institute’s application for license, I have full confidence that HEFA will do the right thing.